LG fired two important shots in the smartphone and tablet wars here at Mobile World Congress, announcing the Optimus 3D smartphone and the LG Optimus Pad, an Android Honeycomb-based tablet. LG says the Optimus 3D is the world's first dual-core processor, dual memory, 3D phone. The Texas instruments OMAP 4430 dual-core processor in the phone, LG says, helps the phone shoot and display 3D HD video while going easy on battery life. The TI processor also helps the phone load WebPages and move between tasks faster, the company says. The Optimus 3D phone has a 4.3-inch VGA display for playing back the 3D video. And best of all, you don't need to wear those dorky 3D glasses to view the video. LG showed videos of people using 3D video to keep up on important family events (baby taking first steps), watching workout videos, and to make business presentations. The new phone has two 5-megapixel cameras on the back to shoot the multiple dimensions of HD video. It shoots 720p video in 3D and 1080p video in 2D. The video can be viewed on a TV screen using an HDMI output, or wirelessly on DLNA-enabled home entertainment components. LG says it has a new deal with YouTube allowing 3D video to be uploaded easily and with special features. The phone will be sold by carriers in May, but no U.S. carrier has been announced, and no pricing information is available. "Everything is going to change this year. 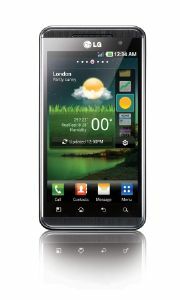 Smartphones are set for generational shift in 2011," said LG CEO Dr. Jong-seok Park. "2011 will be the year LG becomes a key contender in smartphones." LG is predicting a "real tablet war" starting in 2011, and so is launching a serious contender into the fray -- the LG Optimus PAD. The tablet has a dual core Nvidia processor and runs Android 3.0, which adds Google books and Google navigation support to the Google OS. 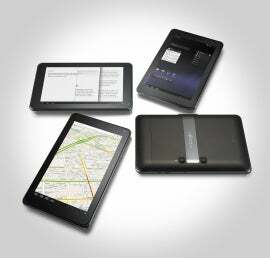 The PAD has an 8.9-inch display; the tablet is bigger than a Samsung Galaxy Tab and smaller than an Apple iPad. LG believes the tablet hits the sweet spot between portability and optimal screen space. It weighs in at 630 grams compared to the iPads's 730 grams. The PAD, like the 3D smartphone, has two separate cameras on the back for shooting 3D video. A 2- megapixel camera on the front of the tablet can be used for conferencing.